On October 22nd, I took a demonstration class with Brenda Matson at the Arts & Materials Expo. That is held yearly in at the Pasadena, CA Convention Center. I try to take at least one half or full day class each year just to keep up with various teachers, products and approaches. 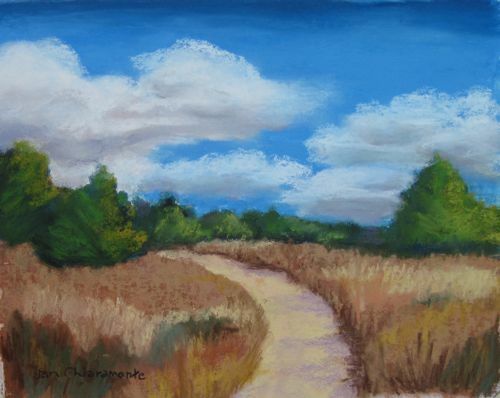 Brenda was demonstrating a method of pastel painting that has become more and more popular each year and that is using a underpainting and then finishing off with pastel. I have read articles about artists using watercolor as the basis of the painting, but typically what is being done is drawing in a lose manner with pastels and then brushing them into the surface of the paper with either water or acetone (we used nail polish remover!). 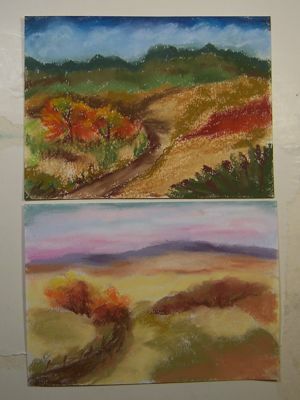 Some artists (like Brenda) change the color of the washes to approximate what she wants as a background. Others, just use a dark brown or other color to indicate the darker areas in the finished painting. Unlike some pastel artists that keep the painted background very loose, Brenda starts at the top of the painting and pretty much completes sections as she moves down by brushing in the pastel, waiting for it to dry and then going back over with her next layer of colors. She works down from wet to dry to the bottom of the painting. Brenda had a collection of photos she took in Maine this year and she used a seascape for her demonstration. Once we saw how the brushing of the color into the surface simplified the next layer or layers, we were on our own. And I jumped into my usual way of working all over the scene….although I always start with the sky as well. Not only was this the first time I had painted a pastel over a “painted” surface, but it was also the first time I used heavy grit paper. I typically use Canson’s Mi Tientes, so this was truly like working on sand paper! I have some other stock that I will be using to experiment with this process. Some companies have been producing boards with this surface, making handling and framing much easier than thinner paper. The only problem is that since you are wetting the surface, it has to be at least of watercolor paper strength, so my Canson’s won’t really work. Fortunately, there are more and more heavy, gritty papers being produced. There have been many articles in the national magazines with discussions of creating your own rough surface by painting a layer of acrylic gesso with sand added onto heavy paper or boards. In that case, you not only have created a surface that can hold many layers of pastel (a drawback of Canson’s paper), but you can even include brushstrokes as a way of adding texture. This is definitely a process that I’ll be experimenting with as time goes on. This weekend is also the annual Art Learning and Product Expo being held in Pasadena. I’ve signed up for a class Friday morning with Brenda Madson and I’m really looking forward to the new products, demonstrations and classes going on through Sunday. The two paintings above are, of course, for my 100 paintings challenge…..where I’m determined to complete 100 pastels of the same approximate scene and size (5 X 7), but done in 100 different color ways, etc. I’ve even changed some of the background mountains into distant trees just for a kick. My eventual goal will be a photo of all 100 paintings for a poster……..however, at this rate, I’m not sure if I won’t be having to come down in spirit to finish! Never fear…after this month’s full plate of competitions, I’m going to set a schedule and GET THIS DONE! Oh, and I just received my first official, written rejection letter from the Californian Art Club’s exhibition in conjunction with the South Pasadena Chamber of Commerce. The “rejected” painting is just below and called “Above the Arroyo”. I am going to frame this for posterity…..it certainly shows I’m trying! This is a 9 X 12 soft pastel on Canson’s Mi Tientes, using primarily Unisons. 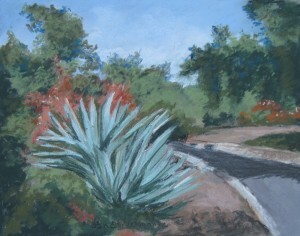 This is my entry into the most recent call for exhibition submissions by the California Art Club. This is in conjunction with the South Pasadena Chamber of Commerce. Accepted paintings will be on display the SouthPas ArtFest 2010 from October 20 through November 13 at the SoPas Gallery, located at 1121 Mission Street, South Pasadena, CA. The paintings were to be of South Pasadena and/or the Arroyo. Unfortunately, the leaves haven’t really been changing a lot in the Arroyo and I wasn’t drawn to anything in particular, but this scene along the road that traverses the top of the Arroyo caught my eye.